Delaroche was a student of the noted French Neoclassical history painter, Antoine-Jean Gros (1771-1835), and closely allied with one of the most enterprising dealers of the period, the Maison Goupil. For over a decade, in the mid-nineteenth century, Delaroche was considered “the most famous (and consequently the most collected) painter of the day, attracting patrons throughout Europe and beyond” (Stephen Bann). Delaroche’s early works were primarily based on classical themes from the Old Testament, but gradually his interests switched to realistic scenes from English and French history. 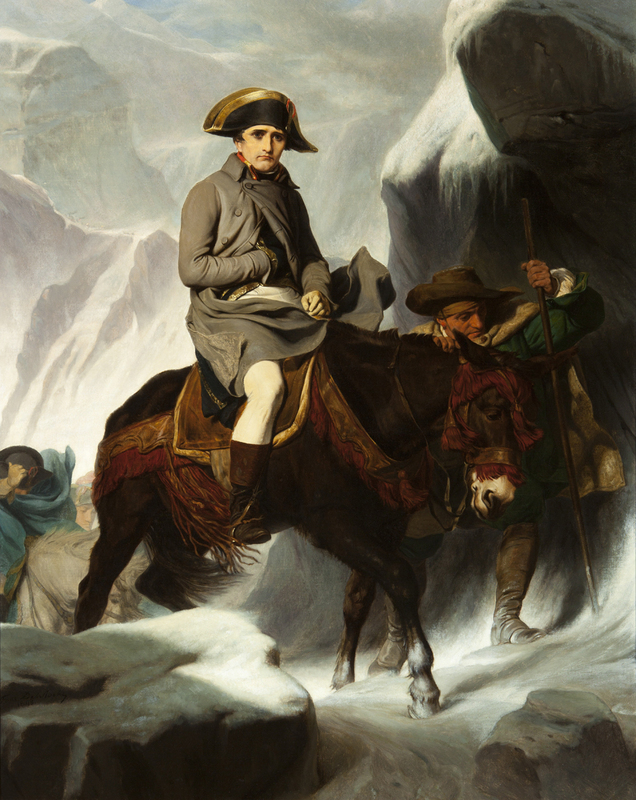 In response to Jacques-Louis David’s theatrical and flattering portrait of Napoleon on a rearing stallion, Delaroche was commissioned to paint a more accurate image of Bonaparte’s journey through the Saint-Bernard Pass. Combining his academic training with the emerging romantic style, we see the Emperor cold and bedraggled on the back of a tired mule. Delaroche’s intent was not to undermine the emperor; rather, he wanted people to see Napoleon as a human, not worshipped like a god. Delaroche, a master of historical painting, produced five versions of Bonaparte Crossing the Alps: One version hangs in the Louvre; a second version, commissioned by the third Earl of Onslow, dated 1850, belongs to the Walker Art Gallery in Liverpool; the third hangs in Paris’ Musee Frederic Masson; and the fourth was purchased by Queen Victoria and hangs in Buckingham Palace. The painting currently in The Knohl Collection is the only version that remains in private hands and the sole canvas in pristine condition. In 1984, Elisabeth Foucart-Walker wrote an excellent scholarly article on Delaroche’s painting, Napoleon Crossing the Alps. The article was published in the La Revue du Louvre et des Musees de France. (see Elisabeth Foucart-Walter, Paul Delaroche et le thème du Passage du Saint-Bernard par Bonaparte, La Revue du Louvre et des Musée de France, 1984). Elisabeth Foucart-Walter is the Curator of French museums and Stephen Bann is Professor of History of Art at the University of Bristol and Professor at CASVA, National Gallery of Art, Washington, DC. His publications include Paul Delaroche: History Painted (1997).